Daily Illuminator: Warehouse 23 Spring Special! March 28, 2018: Warehouse 23 Spring Special! Spring has sprung on Warehouse 23, so we've begun our own spring cleaning. We're giving away bonus loot with qualifying orders during our Spring Special, starting today and running through April 30, while supplies last! Simply make an order for physical SJ Games gear that meets the price thresholds below, and you'll get extra items. Spend $25 or more: A random Munchkin mini-expansion, including The Guild, Skullkickers, Kobolds Ate My Baby, or Love Shark Baby. Spend $50 or more: One copy of I Hate Zombies. Spend $75 or more: One copy of Bill & Ted's Excellent Boardgame. Spend $100 or more: One copy of the Chez Geek House Party Edition. Plus, these freebies stack. So if you spend $100 or more, you get all the extra swag! In addition, we're doubling the included free promos for every order during the sale. 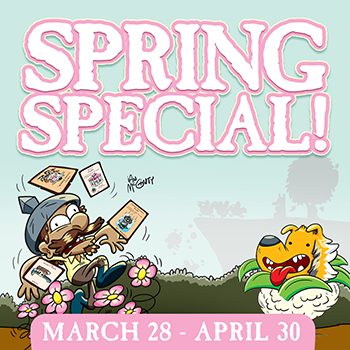 That means you'll get a fat stack of Munchkin promos regardless of how much you spend! Take advantage of our generosity and get some free games for spring!